WOLVERHAMPTON: Liverpool manager Jurgen Klopp believes an early injury to defender Dejan Lovren highlighted why he chose to name a second-string side in bowing out of the FA Cup 2-1 to Wolves on Monday. However, the Croatian pulled up with a hamstring injury after just six minutes and was replaced by 16-year-old Ki-Jana Hoever. “Hamstring, is what I heard – without any signs before,” said Klopp on what forced Lovren off. “I asked everybody, no signs, nothing, just out of the blue, so that’s the decision you have to make. Hoever’s introduction meant Liverpool fielded three teenagers for the majority of the match with Rafael Camacho and Curtis Jones also handed debuts. However it was the visitors’ most experienced player, Milner, who was at fault for the opening goal when Diogo Jota caught the former England international in possession in midfield and put Jimenez clean through for the Mexican to score his seventh goal of the season. Without Mohamed Salah, Roberto Firmino and Sadio Mane, Liverpool were struggling to get any momentum going forward. 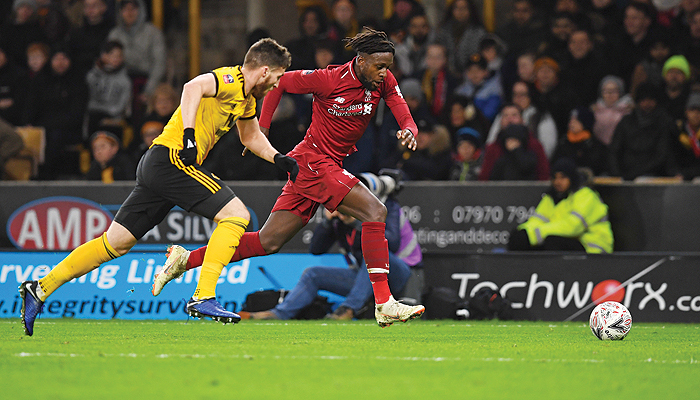 But the visitors were level out of nothing when Origi collected a loose ball on the edge of the area six minutes into the second period and smashed the ball high past John Ruddy. Wolves, though, have made a habit of upsetting the Premier League’s established top six in their first season back in the top flight. After beating Chelsea and Tottenham and holding City, Manchester United and Arsenal in the Premier League, Liverpool can now be added to the list of scalps for Nuno Espirito Santo’s side thanks to a wonder strike from Neves. “He has talent, he has done it before and we encourage him to shoot from range,” said Wolves boss Nuno Espirito Santo. “It was a good strike.” Only a brilliant save from Ruddy denied Xherdan Shaqiri a stunning equaliser and Liverpool a replay as the Swiss’s free-kick was touched onto the inside of the post by the Wolves goalkeeper. However, with Liverpool still in pole position to deliver a first league title in 29 years, the German coach defended his selection to minimise the chance of his stars suffering injuries. “We played a similar line-up and had three tough games in the last couple of weeks, so it was clear we had to change,” Klopp added after a run of four Premier League games in 13 days over the festive period.